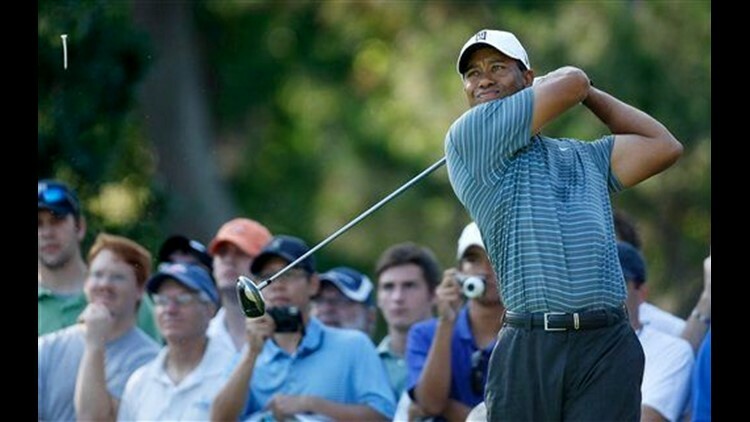 PONTE VEDRA BEACH, Florida (AP) - So much about Tiger Woods after major knee surgery looks the same. He won the Arnold Palmer Invitational with a birdie putt on the last hole that everyone knew he was going to make. Even when his swing was out of sorts last week at Quail Hollow, he somehow was in the thick of contention until the final two holes. But this is not the same Tiger Woods. He is missing his power, whether it's off the tee with a driver or from the fairway with irons that are sometimes two more clubs than what he used before surgery last June to rebuild his left knee. The power shortage was never more evident than the final round of the Masters, playing with Phil Mickelson, when Woods usually was the first to hit from the fairway. Even his rival couldn't help but notice. "I kept having to wait for him to hit," Mickelson jokingly said on Tuesday. That wasn't the case the last time they played together at Augusta National, the final round in 2001, when on some holes Woods hit it farther with a 3-wood than Mickelson did with a driver. More evidence came last week at Quail Hollow. By measuring drives on the 56 holes that were not par 3s, Mickelson's average tee shot was nearly 14 yards longer than Woods'. Statistics can be misleading, especially over the first two rounds because they played on opposite ends of the draw. But in the third round, when they were separated by one group, Mickelson was longer off the tee on 11 of the 14 driving holes. Mickelson's average drive was 317.6 yards, Woods was at 300.5 yards. Woods has an answer for his sudden loss of length. "I've been away from the game for a long time," he said on Tuesday, referring to his eight-month layoff after the U.S. Open. "And it's going to take a little bit of time before my body gets back to where I can hit the ball the same distances. I don't hit the ball the same distance with my irons or my driver." What he doesn't have an answer for is when he will get it back. Woods said at Quail Hollow that he was just starting to get some "pop" back in the swing, which had been missing earlier. He spoke about the rotation required to generate speed in his swing, and the importance of not stretching the ligament. He noticed the difference during his first tournament back in Arizona. "I just didn't have the pop in my body, nor should I," he said. "It takes time for anyone who has a reconstruction (of the ACL) to come back and get the speed back and the agility and all those different things. Most athletes take over a year to get back. With my sport, I've been able to get back sooner than that, just because of the nature of my sport." Distance is not an issue at this week's U.S. Players Championship, where the TPC Sawgrass is only 7,215 yards. Like most property in Florida, it's all about location. Even so, Woods bristled at the suggestion from TV analyst Johnny Miller that he would be better off using a 3-wood to navigate the Stadium Course. Remember, he used only one driver in winning the British Open at Royal Liverpool in 2006. Then again, the links course was dry and brown, and the only water on the course was in bottles for drinking. "We've got par 5s out here. You've got to be able to use it," Woods said. "If Johnny says you can't hit drivers on 9 and 11, you're giving up two opportunities to get close to the green." The last guy to leave a driver out of his bag was Mickelson last summer at the U.S. Open, when he played the first two days with Woods. Before that, the last time they were paired together was at the Deutsche Bank Championship, where Mickelson beat him in the final round. Asked about Augusta last month, Mickelson didn't notice anything out of the ordinary - except that Woods was first to hit. "It seemed like he was playing like he normally did," Mickelson said. "It seems like he has as much speed as he wants to have. With that being said, I've been able to increase my speed a little bit this year, as well. And even though I've weakened my irons a degree or two, I'm still hitting them 5, 6 yards longer than I did last year. So I've almost gained 10, 12 yards with my irons without trying." Mickelson has always been more infatuated with length than Woods, although Woods' aura has been built around power. Woods is having to make do with less at the moment, which is OK with him. He has been experimenting with different shafts and lengths of his driver, although he keeps going back to what he had. The Players Championship will be the fourth straight tournament that Mickelson has a chance to replace Woods at No. 1 in the world ranking. Mickelson would have to win and have Woods finish worse than fourth place alone for that to happen. Is change imminent? Geoff Ogilvy isn't so sure. "Every time that there's been this talk about, 'He's vulnerable,' and 'He's not where he was,' he goes and wins eight of the next 12 tournaments," Ogilvy said. "So I don't think anyone out here is concerned that Tiger is not going to be Tiger anymore."